Beautifully engraved cancelled $1,000 Bond Certificate from the famous Canadian National Railway Corporation issued in 1986. 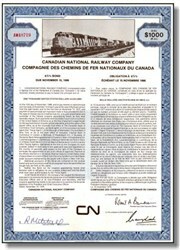 This historic document was printed by the Canadian Banknote Company and has an ornate border around it with a vignette of a CNR Train. This item has the printed signature of the company president. The railway can trace their history through more than 200 separate companies and as far back as 1836 with the opening of the first public railway in Canada, the Champlain & St-Lawerence Railroad. The Canadian Government formed Canadian National Railways to solve a financial and transportation crisis arising from a railway boom in the period following 1900. Between 1900 and 1916 railway mileage in Canada increased from over 27,000 to 77,760 kilometers as railway companies expanded their lines in eastern and western Canada. Following the success of the Canadian Pacific Railway, Canada's first railway connecting the Atlantic with the Pacific coast, two new transcontinental lines were built before World War I. These were the Grand Trunk Pacific Railway and the Canadian Northern Railway. However, as a result of the outbreak of the war in 1914 and high construction costs, these railways quickly encountered serious financial difficulties. On the recommendation of a Royal commission, in 1917 the federal Government decided to combine the operations of the government-owned Canadian Government Railways and the privately owned, but financially troubled, Canadian Northern Railways System. The new railway was called the Canadian National Railways in 1918. A year later, Canadian National took over the operations of another western line, the Grand Trunk Pacific Railway. In 1923, following the difficult negotiations, CN assumed control of the Grand Trunk Railway of Canada, the oldest and largest railway company operating in eastern Canada. With the nationalization of these lines, Canadian National became the largest railway in Canada. It operated over 35,000 kilometers of railway lines linking the country from coast to coast as well as lines in the United States. Over the years, other railway lines, such as the Newfoundland Railway, were also absorbed into C.N. During the 1920's, CN worked hard to combine these different railway companies into an efficient and profitable railway system. The company adopted innovative technology, such as the development of Canada's first diesel-electric locomotives to reduce costs and improve service. Since the 1920's the character of the railway industry has undergone tremendous change due to technological innovations and growing competition from automobiles and trucks. These changes affected every aspect of CN's operations. For example, steam locomotives, a symbol of railway technology for over 100 years, were abandoned in favor of more efficient diesel-electric locomotives by 1960. Canadian National stopped operating passenger trains in 1978, in order to concentrate on its main source of business, freight trains. Passenger railway service is now operated by Via Rail Canada. The cars that carry freight have changed from small, wooden vehicles to specialized cars of metal construction, designed to ease loading and unloading of their cargo. After more than 75 years as a government-owned railway, Canadian National was privatized in 1995.